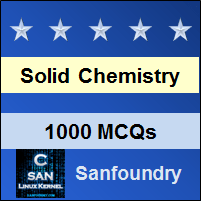 This set of Solid State Chemistry Multiple Choice Questions & Answers (MCQs) focuses on “Thermogravimetric Analysis”. Explanation: Thermal analysis is defined as the measurement of physical and chemical properties of materials as a function of temperature. In practice, however the term thermal analysis is used to cover certain specific properties only. These are enthalpy, heat capacity, mass and coefficient thermal expansion. 2. Which of the following method can be used for the measurement of change in weight of the oxysalts? Explanation: Measurement of change in weight of the oxysalts and hydrates can be achieved by thermal analysis as they decompose on heating, In which we measure the physical and chemical properties of the materials. Wide range of materials can be studied. 3. What are the two main techniques for thermal analysis? Explanation: The two main thermal analysis techniques are thermogravimetric analysis known as TGA which measures the change in weight with temperature and Differential thermal analysis known as DTA which detects changes in heat content. 4. Dilatometry is also known as by which of the following names? Explanation: A fourth thermal analysis technique is Dilatometry in which the change in linear dimension of a sample as a function of temperature is recorded. Recently it has acquired a new name, thermomechanical analysis (TMA). 5. Which of the following statements given below is false? b) TGA and DTA can be carried out simultaneously. c) TGA, DTA and DSC are measured using different instruments. d) TMA is a recent name of Dilatometry. Explanation: With modern automatic thermal analysis equipment it I possible to do TGA, DTA and DSC using the same instrument, with some models, TGA and DTA may be carried out simultaneously. However, the thermal analysis equipment is necessarily rather complicated and expensive in order that a wide variety of thermal events and properties may be studied. Explanation: Thermogravimetric is a technique for measuring the change in weight of a substance as a function of temperature or time, the result usually appears a continuous chart record, a schematic, typical, single step decomposition reaction. 7. What is the range of the rate in ◦Cmin-1 required during the heating process in TGA? Explanation: In the process of TGA thermogravimetric technique, the sample usually a few milligrams in weight, is heated at a constant rate, typically in the range of 1-20 ◦Cmin-1 and a constant weight Wi, until it begins to decompose at temperature Ti. 8. Under conditions of ______________ heating, decomposition usually take place in thermogravimetry. Fill up the suitable option from the choices given below. Explanation: In thermogravimetric analysis (TGA), decomposition usually take place under dynamic heating conditions over a range of temperature Ti to Tf and a second constant weight plateau is then observed above Tf, which corresponds to the weight of the residue Wf. 9. The Ti and Tf temperature depends on which of the following factor? Explanation: Initial and final temperature Ti, Tf depends on variables such as heating rate, the nature of the solid (e.g. its particle size) and the atmosphere above the sample. The effect of the atmosphere can be dramatic. 10. What is the temperature required for the decomposition of CaCO3 in degree Celsius? Explanation: The decomposition in the thermogravimetric analysis of CaCO3 is completed in vacuum at ~500◦C but in CO2 at one atmosphere pressure, decomposition does not even commence until above 900◦C. Ti, Tf pertain to the particular experimental conditions, therefore and do not necessarily represent equilibrium decomposition temperatures.